The Creed is everything we, as Catholics, believe in faith. Some which we have already dealt with can be “backed up”, as it were, with secular historical testimony. Some aspects, such as the one we deal with today, are not only impossible to prove, but difficult to even comprehend. We speak of Jesus, the Son of God, as being born of a woman. Mary is told when she asks how this could possibly happen, “The Holy Spirit will come upon you-1”. The Lord, the Giver of Life sanctifies her womb and Mary becomes the Mother of God. 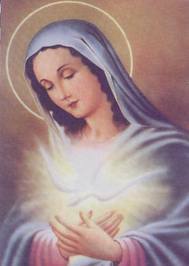 ”Let it be done to me according to your word. . .-2“ Mary responds to her calling, her vocation. Let’s take a few steps backward, for a moment. Mary is greeted by the Angel, with the familiar words of “Hail, full of grace-3”. Mary, being greeted in such fashion, leads the Catholic Church to realize and proclaim the dogma of the Immaculate Conception-4. How could Mary be full of grace? Was she not like every other son or daughter of Eve, tainted with original sin? No, she isn’t. The dogma proclaims that from the first moment of Mary’s own conception, because of her future role as Mother of God, she comes into this world free of original sin. So imbued with God’s grace, Mary gives her fiat, her acceptance to her role. We try to get our arms around this portion of the Creed, but it seems to defy reality. It does not conform to the way things happen, here on earth. But then, neither does the curing of the sick, by word or touch; neither does the suspension of the law of gravity and thus walking on water; neither does the raising of the dead back to life. None of these conform to the way things happen on earth, but God, the Creator of these laws, can and does override them. From this beautiful section of the Creed, we see the Divine Love that God has for mankind. We see through the eyes of faith that God was not about to abandon His people, when the first sin was committed. We speak in words that are restricted by time, so we can only say that when this happened, He did such and such. But God has no restrictions of time. The concept of time came with creation. Things are and then, after a period of time, are not, they cease to be. God IS. God exists. His intention is always to be involved with His creation. Such is His love for us.